Crochet ponchos returned to the fashion scene a few years ago. Ponchos provide the same warmth and elegance as a shawl, but I particularly love the way they stay on my shoulders without slipping off. A vintage silhouette with a modern fashion twist, crochet ponchos are a great way to show off the beauty and utility of crochet. 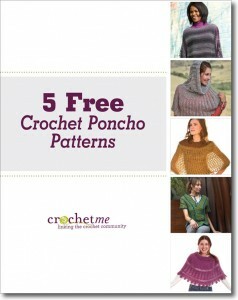 In this free eBook, we gathered five free crochet poncho patterns. From lacy ponchos in luxurious yarns to warm designs that are quick to make, plus easy crochet ponchos for beginners, you’re sure to find the perfect accessory in this free collection. Throw a poncho on over your shirt or sweater, layer it over a jacket, or pair a lace poncho with an elegant evening dress. Whatever poncho style you are looking for, you will find a great option in these five free patterns in our newest 5 Free Crochet Poncho Patterns eBook. In these patterns, you will find the perfect accessory for a stroll through the park or an afternoon in the office. Explore the lacy fabric you can create with mohair and broomstick lace with the Broomstick Lace Capelet, a lightweight and elegant crocheted poncho. 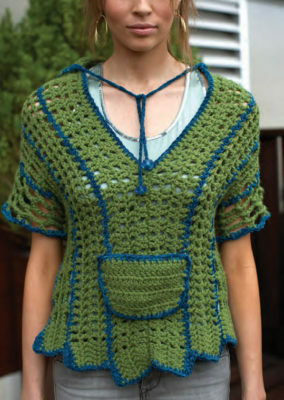 Or explore how much fun crocheted ponchos can be with the Hooded Poncho. 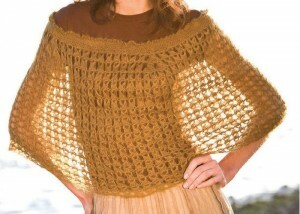 The Sycamore Poncho by Lily M. Chin is a fast and easy crochet poncho pattern. It’s perfect for crocheters of all levels, including beginners! Crocheted in a beautiful ombre sport-weight yarn, this crocheted poncho is worked in simple solid sections that showcase the yarn and contrast with openwork mesh panels. Throw this fast poncho on over a t-shirt or pair it with a sweater for the office. 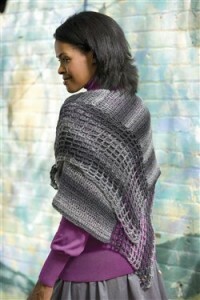 The Lady Blue Warmer by Renee Barnes is a delicate lace creation that features a sassy poncho with a hood! The lace fabric of this lace poncho is warm and elegant—the perfect layer for a little black dress or a pair of jeans and a t-shirt. Delicate beads crocheted at the edge give a bit of weight for ease of wearing and a touch of sparkle. The Broomstick Lace Capelet by Kate Pullen is a silky mohair that creates a luxurious and surprisingly warm poncho in broomstick crochet. You create this pattern by picking up loops and placing them on a large stick or knitting needle to keep the loops of uniform size. This lace crochet poncho is a timeless mix of old and new, using vintage broomstick lace stitches and an elegant silhouette. The Hooded Poncho with Boot Covers by Erika & Monika Simmons is a fashionable crocheted poncho and boot cover that takes advantage of a unique shape to flatter the feminine silhouette. Shorter in the back and longer in the front, this crochet poncho pattern uses the addition of laces in the back to transform a loose poncho into a fitted top. Matching boot covers are perfect for a little extra warmth and fashion. contemporary appeal at the same time. In these five free patterns, you will find the perfect accessory for a stroll through the park or an afternoon in the office. Add one or more of these free poncho patterns to your wardrobe by clicking here to find the 5 Free Crochet Poncho Patterns eBook today! P.S. 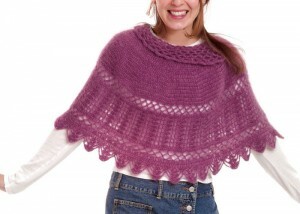 Do you have friends looking for stylish and warm crochet poncho patterns? 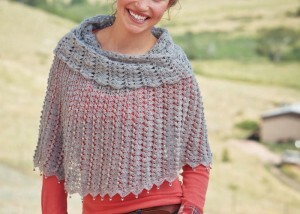 Send them the link to download their own copy of the 5 Free Crochet Poncho Patterns eBook.